All you need to know to enjoy visit to Northern Peru & Amazon River region. Money, health, safety, transport, accommodation & food & drink issues covered. Frequently-Asked Questions about Northern Peru. A selection of Peruvian banknotes. The currency is the Sol (meaning 'sun'). The code for the currency is PEN. Are US Dollars readily accepted? Yes, USD are widely used in Peru. You can pay at most hotels, supermarkets and restaurants with them, using the exchange rate of the day, but in more remote locations, and in smaller businesses, you do need to have PEN. Please note that it is difficult to buy things using larger bills, though (ie $50 or $100), as there is a fear of forged notes and often a lack of change. So, it is a good idea to bring bills no larger than $20. Please also note that many establishments won't accept US bills with rips, however small. It is possible to change Euros, UK Pounds, Canadian and Australian Dollars in major cities, such as Lima and Cusco, but it would be much easier for you to carry US Dollars, as you can buy products directly with them; and it is likely that in some places you won’t be able to change your non-USD currency. 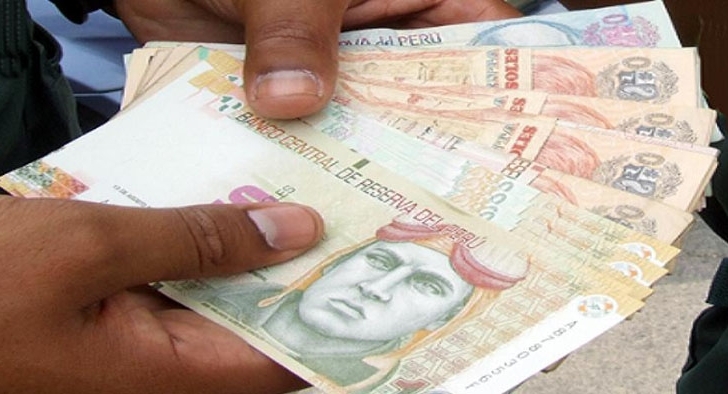 We suggest you change money once you arrive in Peru, as the exchange rate is generally better in Peru than overseas. You could change some money at the airport in Lima (open 24 hours), and the rest of it in your other destinations. Hotels will often change USD, but the rate is usually not particularly competitive. Alternatively, there are a number of casas de cambio (exchange shops) to be found in Lima and Cusco, with an advertised rate for various currencies. It is a good idea to ask for a receipt. Also, you will see cambistas on the streets (men or women, who usually wear a blue or green jacket with $ on the back) who buy and sell USD. They are generally trustworthy, but still probably a last resort, as you may not wish to do a cash transaction in full public view ... and the potential to be ripped off is greater, as they do not have a fixed business address. You can use ATMs to withdraw money in all Peruvian cities (but not in remote areas like Amazonas, Colca or the Titicaca Islands), using credit or debit cards. You will have the choice of withdrawing money in either PEN or USD, which is convenient. It is always a good idea to have more than one card with you on holiday, in case one gets swallowed or lost. How much do money am I likely to need for our trip? Taxi (under 30 minutes): $5 / £3. Please note that taxis don't have metres, so fares have to be arranged prior to setting off. There are however various apps (eg Uber, Taxibeat, Easy Taxi) that are worth downloading to make the booking and payment process easier. Also, most hotels will be able to arrange a taxi for you, but you may have to pay above the going rate. Whom should one tip in Peru and how much? This is a difficult issue. Peruvians do not tip well, if at all. From this perspective, you should tip according to how well you were served. Drivers & maids: not traditionally tipped, but can leave loose change. Bellboys: $1 per piece of luggage. What should I pack in order to visit northern Peru? For a comprehensive list of suggested items, please read our blog post here. What kind of plugs do they have in Peru? The standard voltage in the country is 220V. Please note that many appliances - even from the US - should be able to work at 220V; and a number of Amazon cruise boats have 110V outlets as well. There are two kinds of outlet - two-pinned for either round or flat prongs, as in the picture. There are also outlets that are designed to accommodate both. Adaptors are readily available, and good hotels will be able to lend you one. If staying in an town or city, PeruNorth normally chooses hotels that are centrally-situated, allowing you to walk to places of interest and amenities. Given that Northern Peru is a natural paradise, though, many of the best properties are located away from population centres, to best take advantage of a specific feature, such as Gocta Falls, or eco-system, such as in the High Amazon jungle. Breakfast is included as standard at all our selected hotels. When staying in a remote location, such as at an Amazon or birding lodge, lunch and dinner will usually be included as well. What are the baggage weight limitations on domestic flights? At time of writing, LATAM Peru allows two pieces of hold luggage with a total weight of 23 kg (50 lbs). You are also allowed two pieces of hand luggage: a small backpack or suitcase weighing up to 8 kg (17 lbs); and a personal item, such as a laptop bag or handbag. The fee for excess baggage is $US 12 per kg. NB. Please check for other airlines, and the most recent policies. Do we get air miles for domestic flights in Peru? LATAM Peru is part of the One World network (which includes British Airways, Iberia and American Airlines) so you can claim these flights, if you are member of any One World loyalty scheme. TACA / Avianca is part of the Star Alliance (which includes United Airlines, Air Canada, Lufthansa, Air New Zealand & TAP), and so air miles are interchangeable between member airlines' loyalty schemes. Other Peruvian airlines are not part of international alliances, but do have their own loyalty schemes. How will I get from Lima Airport to my hotel, on arrival? For these details, and more about the arrival process, see our Lima Airport page. At PeruNorth, we recommend to clients that they try to disconnect from the modern, 24/7-connected world as much as possible, but we do appreciate that there are times when you really do need to ring family or deal with an urgent business email. What is the best way to make calls? Most people now travel with smartphones that have international roaming. This is very convenient, but be aware that the charges can be exorbitant. Make sure to check these, before travel. Moreover, there are still a few places in Peru, such as the Amazon Rainforest, that do not have extensive mobile network coverage. If you are planning to make a lot of calls, it may be worth buying a local, pay-as-you-go SIM card. The two biggest networks are Movistar and Claro, and a SIM costs about $US10. Be warned that the customer service of both these multinational giants leaves a lot to be desired, and it may take you longer than planned to make this purchase! Most good hotels have a phone in the room, but again be warned that phoning internationally is costly. Per minute prices are often advertised on or near the phone. Calling cards offer the best value for calling overseas, and these can be bought either before leaving home or on arrival. Rates are often changing. Finally, when in really remote destinations, such as on an Amazon River cruise or at a jungle lodge, the management will usually have a satellite phone. These are only for emergency use, and you will be charged by the minute, at a hefty rate. How widespread is Internet access? In Peru's main cities, it is very easy to connect. If your accommodation does not have WiFi, which most do, then there are many small Internet shops, where you can rent a computer for about $US 1 per hour, or simply connect your laptop or smartphone. In a few areas, such as Parque Kennedy in Miraflores, there is public WiFi. Generally, though, the Internet speed is not as good as in Western countries. Once into the provinces, WiFi is less widespread. Nevertheless, even small towns nearly always have at least one Internet shop. But don't expect to be able to upload all your photos to your blog, or any other activity necessitating bandwidth, as you will probably be frustrated by connection speeds. A few Amazon cruise boats and lodges are beginning to introduce WiFi, but this is based on a satellite connection, and usually very slow. One of the commonest questions, and one that cannot really be answered accurately without knowing the strength of stomach of the person asking! However, to be on the safe side, we suggest drinking bottled water at all times, which is readily available in shops and hotels, and commonly used by Peruvians themselves. In any case, a lot of the tap water in Peru is heavily chlorinated, so does not taste particularly nice. By this rationale, teeth should be brushed using bottled water as well. When buying or ordering water bottles, it is worth knowing that 'sin gas' means un-carbonated, while 'con gas' is carbonated. Sampling the food is one of the great pleasures of a holiday, especially in Peru, with its varied and delicious cuisine, which is gaining a reputation worldwide. But with any change in ingredients, preparation techniques and climates, it can have a detrimental effect on your stomach. The seafood on Peru's coast is an absolute favourite of PeruNorth, but shellfish is renowned the world over for being the cause of many a dicky tummy, so you may wish to avoid this. You may also wish to avoid street food and cheaper restaurants, as the level of hygiene will, in all likelihood, not be as rigorous as that of good hotels and reputable restaurants. What vaccinations and medicines do I need? Malaria - again, especially important if visiting the Amazon rainforest. Some of these you may already have from childhood immunisations, but please check. Will I get sick, if I go to altitude? Acute Mountain Sickness (AMS) is called 'soroche' in Peruvian Spanish, and can occur to all people at altitudes of more than 2,000 m (6,562 ft). As a guide, Cusco is at 3,200 m (10,500 ft), and the highest point of the Inca Trail is 4,200 m (13,780 ft) above sea level. Luckily, the attractions of northern Peru are generally at a lower altitude than those in southern Peru, with Abra Porculla, the mountain pass between Chachapoyas and Chiclayo, being only 2,145 m (7,037 ft) - a dwarf by Andean standards! In any case, if you do include Machu Picchu or Huaraz in your trip, it is good to know the symptoms and preventative measures for AMS. It can lead to dizziness, diarrhoea & vomiting, dryness of throat, loss of co-ordination and difficulty in breathing. I've also found I sleep fitfully, and have vivid dreams, when at altitude. Generally the symptoms disappear after 48 – 72 hours at altitude, but in the meantime, it is recommended to avoid heavy meals, alcohol and strenuous activity. Coca tea is said to alleviate the symptoms, while some people take aspirin, or other altitude-specific medications, such as Diamox. Better hotels will have oxygen available for guests, too. PeruNorth highly recommends acclimatising for at least two days at altitude before undertaking a multi-day trek. If symptoms persist beyond 72 hours, consult a doctor. Please note that if travelling to your home country - or indeed other countries in Latin America - from Peru, may require you to be vaccinated against yellow fever. NB. It is every client's responsibility to have the necessary vaccinations for travel. Will I be robbed in Peru? Peru has recognized that tourism plays an important part in their economy and so has taken great steps in the last few years to change its poor security image. You will find a lot more police, especially plain-clothed officers, and security guards in the areas most frequently visited by tourists. When taking taxis from an airport to your hotel, travel in the more expensive airport taxis and ensure that the drivers have official identification. Never take a taxi waiting outside the airport grounds. Travel in a group if possible, especially after dark. Keep your valuables hidden. Ideally, leave them in your hotel, unless you have to have them with you. Make use of the hotel safe for your valuables. If the safe is at reception, make sure you obtain a receipt, not just for your money belt or wallet, but also for its contents, with each item listed. Avoid going on your own to remote areas / ruins where tourists do not usually go. Seek local advice, and/or take a guide. Read the guidebooks and talk to other tourists to find out which areas are best avoided. Avoid walking around late at night. When arriving in a new town, keep to your original plan and stay in the hotel that you have decided on. Do not let the taxi driver persuade you that your chosen accommodation is fully booked and that he knows a cheaper and better one. He will be working on commission, and the hotel may not be in a safe part of town. Do not wear expensive-looking jewellery. Even if it is not expensive, you do not want to attract attention. In public places, such as a restaurant or bar, have your day pack / handbag / laptop bag close to you at all times, preferably with the straps around your legs or the seat. If carrying a sizable sum of cash, use a money belt. Violent robbery is very rare and the most common type of theft in Peru is actually tourists forgetting bags in cafes or on transport, and simply never getting them back. If you are unfortunate enough to be robbed … just accept it as a travel experience. Make sure that you have good insurance, and that you have read the small print before arriving in Peru, so you know what is required to make a successful claim. You can get a travel insurance quote here. Apart from precious photos, most things can be replaced. Try not to let it spoil your holiday - which is sure to have cost more than the value of items stolen - and don't suddenly believe that every Peruvian is a thief. The overwhelming majority are kind, honest, hardworking people who detest the thieves probably more than you do – when they get robbed they usually do not have insurance! A pre-arranged visa is not required to enter Peru for citizens of the following countries: UK, Ireland, EU countries, USA, Canada, South Africa, China, Japan, Australia, New Zealand. Visitors are permitted to stay up to 183 days on a tourist visa that will be issued at point-of-entry (which is usually Lima Airport). For other visa information, please contact your local Peruvian Consulate or embassy. We hope you find the above information useful. If you have further queries, please don't hesitate to get in touch.